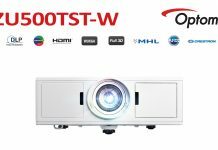 The Optoma BR451 is the ultimate 5,000 lumen XGA projector for classrooms, corporate boardrooms and multi-purpose offices. Its 20,000:1 contrast ratio, sRGB and REC.709 color profile support produce luminous, sharp and colorful images with accurate colors that’s visible practically any time of the day. A PC-free image viewer and document reader displays office documents, PDFs and images from USB storage devices. HDCast Pro connectivity provides wireless screen mirroring with Android, Mac OS and Windows devices. LAN display supports up to 4 simultaneous computers while USB display mirrors Android and iOS devices. A 1.2x zoom and four corner geometry correction allows flexible installations while robust input options include HDMI, VGA and RJ-45 for connectivity to a wide range of devices.